She's Fantastic: The Girls of WINX CLUB! The Girls of WINX CLUB! This one is likely to spark up some "action figure vs doll" debate. Winx Club is an Italian Magical Girl series (a'la Sailor Moon) featuring a group of girls who attend a special school for fairies. There are neighboring witch and hero schools that create a very Harry Potter-like environment. The main characters are six girls, each with a different "theme" (i.e. Plants, Water, Music, etc). The girls mostly appear as normal humans (albeit from a variety of different worlds), and only turn into fairies when called upon. The change sequence is a staple in the Magical Girl genre, and here I thought He-Man and She-Ra were being original. In 2012, the Winx Club were the 3rd most popular dolls in the world. These dolls are usually large barbie-sized things with rooted hair and cloth. The toys in this review however, are small, super-articulated, 3.75" scale, completely-sculpted little beauties. There's something really fun about these toys. I feel like I'm getting in on the ground floor with a new She-Ra-ish property. You may love them or hate them, just check out the review and decide for yourself. The toys in this series are from Season 4 of the cartoon (I only watch the first season on youtube). Apparently every season, the girls advance their powers and take on slightly different fairy forms (kind of like the advancement of the Power Rangers in each season). In season three, they achieved their Believix forms (which means bigger wings maybe? ), and also, they appear to have formed a rock band in their human identities, hence the Concert Series. Here is an example of the packaging for the two complimentary series. And here is the concert series. The packaging is basically identical for all the figures with the exception of the colored arc around the outside of the bubble and the shape it culminates in. In these pictures, the arc is Aqua and ends in a waterdrop shape, because Aisha has control over water. It's pretty thematic and self-explanatory. 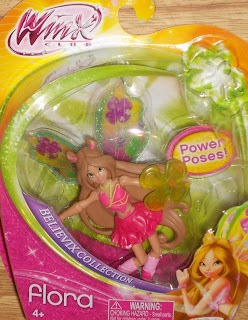 Okay, first up for the figures is Musa, the fairy of music. The group is pretty culturally diverse and Musa is the token Asian character. Next up is Tecna, the fairy of Technology. This look marks a major change in Tecna's appearance. Up until this point, she had very geometric wings that looked to be made of green energy mesh and she wore a metal helmet... all heavily implying the "technology" focus of her powers. She also talked in an almost robotic monotonal manner. Her character has gone through a ton of changes and overall she's my favorite character. Next up is Aisha, the fairy of Water. In some translations from the original Italian, she is known as Layla. In the cartoon, she is represented as Black, and I think that was the intention here, but she looks almost identical to the Hispanic character. In my area of the Northeastern USA, this figure is by far the hardest to find, hardly showing up in any assortments. The final three figures also came with variants of their Concerts Collection versions. 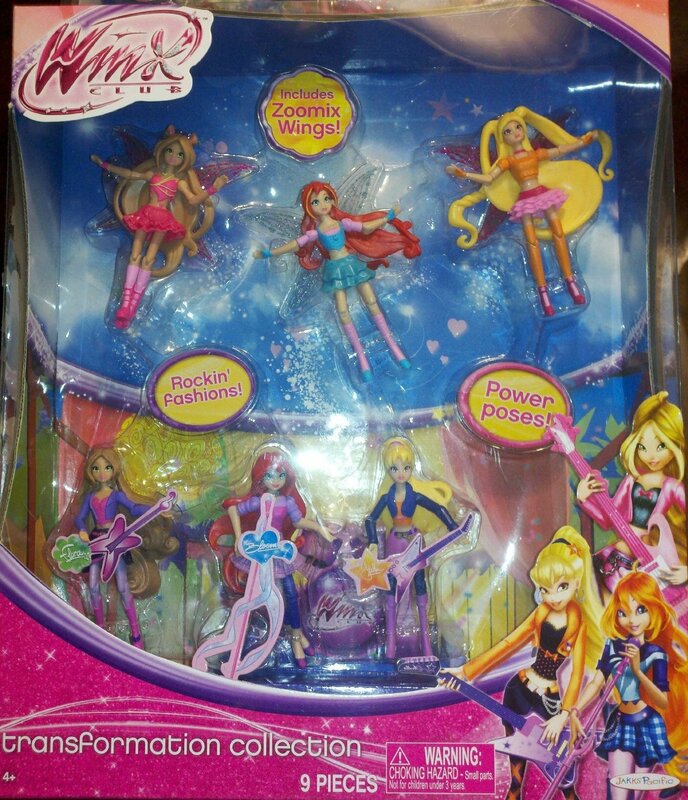 There is a Target exclusive Transformation 6-pack featuring three characters in both their Fairy and concert forms. The concert forms are repaints of their single-pack versions and the fairy forms come with Zoomix wings, which are straight, pointy wings as opposed to the larger butterfly-like variations the single-packs come with. 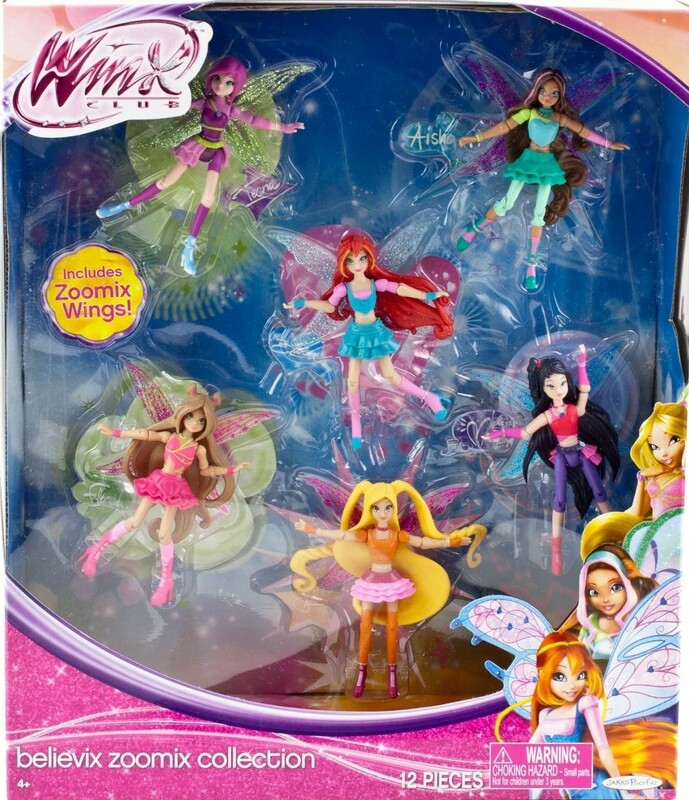 (The wings on all Winx figures are removable and interchangeable). The concert variation in the multipacks do not come with musical instrument accessories. Above is a photo of the Transformation Collection and below is the Believix Zoomix collection which gives them each a pair of Zoomix wings. First up of this batch is Bloom. She is the main character of the series who discovers she's a Fairy in the first episode. She is a Dragon fairy. Next up is Stella, the fairy of Sunlight. She is the spoiled princess, literally, of the group and was the catalyst of the first episode that started the entire adventure. The final lady is Flora, the fairy of Plants. She is the Hispanic member of the group. 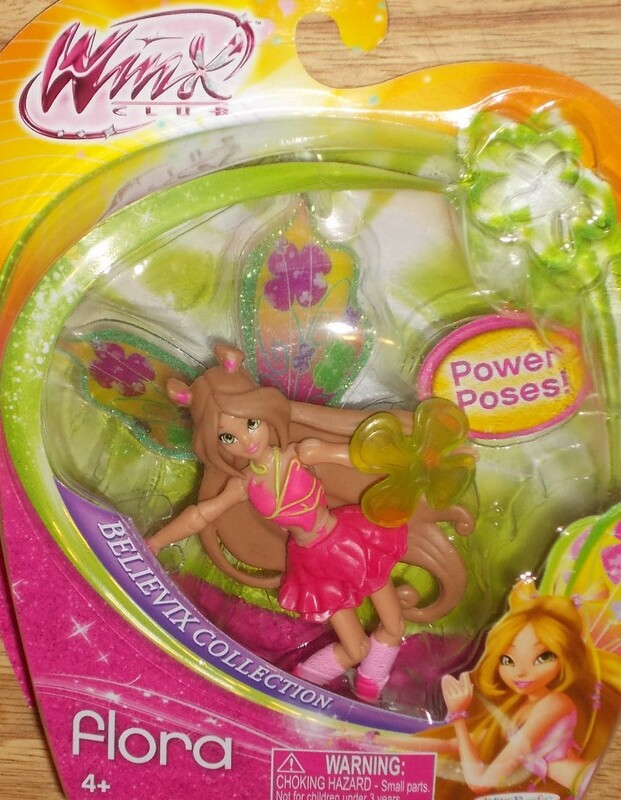 Her fairy form in these pics is wearing the Zoomix wings from the multipack. Her single-pack wings are green and purple and supposedly reminiscent of plants (I hate them). Here is a pic of Flora with her leafy wings. Fairy form from Left to Right: Flora, Stella, Bloom, Musa, Tecna, and Aisha. Here is a pic of Flora, Stella, and Bloom with their Magical Mini counterparts. Magical Minis were the previous series of mini figures based off the Season 1 designs. I'm not sure of the maker and they are difficult to find at a reasonable price now. The character to the far left is the main antagonist of the series, the witch Icy. They are cool looking figures. If they made some of the dudes from the show I would totally collect.